The Panerai Radiomir has an exciting history. It was originally designed for Italian combat divers, but eventually developed into a popular, prestigious luxury watch that enthralls watch enthusiasts and celebrities alike. The Panerai Radiomir has been accompanying divers for over 80 years. Officine Panerai, the company's full name, developed the first models in 1936 and delivered them to special units in the Italian Marines. Today, the once-military watch is an iconic timepiece, enthralling celebrities such as Heidi Klum, who owns a red gold version. The watch's main features are a cushion-shaped case, delicate wire loop attachments for the strap, and a cone-shaped crown. Unlike the famous Luminor, the Radiomir doesn't have a crown-protecting bridge. It received its name from the luminous material used, which included radium; Panerai patented the luminous material in 1916. The self-illuminating, radioactive material was also used in other diving instruments, such as depth gauges and compasses. 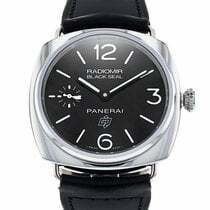 How much does a Panerai Radiomir cost? Prices for a Panerai Radiomir range from around 3,300 euros for a pre-owned Black Seal model to 18,000 euros for a new 18-karat red gold model. The case diameter can be anywhere from 45 to 47 mm; you have the choice between a stainless steel, titanium, gold, or ceramic case. If you want a Radiomir watch that is similar in design to the 1930s models, you should look at the Radiomir California 3 Days or the Radiomir S.L.C. 3 Days. Both timepieces have a 47-mm, cushion-shaped stainless steel case. The California model is named for its dial type, which features Arabic numerals on the bottom half and Roman numerals on the top. Panerai uses stick indices at three, six, and nine, and a triangle at 12 o'clock. The Radiomir S.L.C. 3 Days has an even more minimalist design. "S.L.C." stands for "Siluro a Lenta Corsa," referring to the "human torpedo," a type of submarine used by the Italian Marines in the 1930s. Panerai includes a dial inspired by historical timepieces. Dot and stick indices are used as hour markers, with sticks located at three, six, nine, and 12 o'clock. An S.L.C. Torpedo is displayed above the six o'clock position. Both models are powered by the in-house caliber P.3000. The manual movement, comprised of 164 individual pieces, runs for three days once it's fully wound and vibrates at 21,600 A/h. A pre-owned Radiomir California 3 Days (PAM00424) can be purchased for less than 5,000 euros. However, it's likely you'll spend around 5,300 euros. New, the timepiece costs around 5,900 euros. The Radiomir S.L.C. 3 Days (PAM00425) costs around 5,000 euros pre-owned and around 5,500 euros new. There are also models with small complications in the Panerai Radiomir collection. Small complications include automatic winding, a small seconds, a date display, or a GMT function. The Radiomir 10 Days GMT Automatic has a GMT function, as its name suggests, and is a highlight in this series. It features an additional central hand to indicate the time in another time zone. A small 24-hour hand on a subdial at nine o'clock indicates whether it's currently day or night in the second time zone. Panerai also utilizes this subdial for the small seconds. Directly across at three o'clock is the date window, and the power reserve display is located above the six o'clock position. Thanks to the three barrels, the in-house caliber P.2003/6 can run for an astounding 10 days . Pre-owned models with reference number PAM000323 cost at least 7,000 euros; new, this 47-mm wristwatch costs around 8,500 euros. If you don't need a GMT function, but you still want a long power reserve and a date display, then the PAM00384 would be a good fit. The Radiomir 8 Days Ceramica has a 45-mm ceramic case, an 8-day power reserve, and a power reserve display. Pre-owned timepieces cost around 7,500 euros; new, you should plan on spending at least 8,500 euros. If you want to purchase a Radiomir at a comparatively affordable price, you should look at the standard versions in the series. With a diameter of 45 mm, they're somewhat smaller than their historical predecessors from the 1930s, but still a millimeter larger than the Luminor Base models. Seeing as the Radiomir is thinner than the Luminor, it's also a good everyday watch for the office. A model that would perhaps be appealing is that with reference number PAM00183 with a small seconds. Pre-owned models in very good condition are available starting at around 3,800 euros. New, they cost around 5,200 euros. The Radiomir Black Seal Logo (PAM00380), with its 45-mm stainless steel case, is also in this price range. Part of its name, "Black Seal," refers to the elite Italian divers who wear black wetsuits. "Logo" refers to the presence of the Panerai logo on the dial. These timepieces are available pre-owned starting at 3,300 euros and new starting at 3,500 euros. Like the PAM00183, the PAM00380 has a small seconds at nine o'clock. However, due to the comparatively affordable prices, you have to forego an in-house movement. The Radiomir 8 Days (PAM00610) is powered by an in-house movement, the P.5000. The timepiece only features hands for the hour and minutes, making the dial clean and easy-to-read. It also features a power reserve display for its 8-day power reserve. 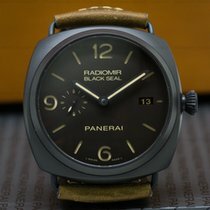 You can purchase a PAM00610 new for around 4,000 euros. Upon first glance, the timepieces in the Radiomir 1940 collection look like any other Radiomir watch. However, if you look closer, you'll recognize subtle differences in the design. The year in the name represents the diving watches developed in 1940 for the Italian Marines. For this reason, current models in the Radiomir 1940 series have similar features to the watches from the 1940s. Instead of the delicate thin wire loop strap attachments, which could break under high amounts of pressure, the original timepieces had lugs resembling horns. In order to achieve a more stable construction, the manufacturer created the case and lugs at the same time using a single piece of steel. Also typical of this watch was its cylinder-shaped crown, which replaced the cone-shaped one. Today, the Radiomir 1940 series has many different manual and automatic timepieces. If you're looking for a clean dial and a classic 47-mm case, take a look at PAM00514 with a small seconds and date display. The large men's watch with the in-house caliber P.3000 costs less than 5,000 euros pre-owned. New versions of the watch cost around 5,400 euros. One highlight of the collection is the Radiomir 1940 10 Days GMT Automatic Oro Rosso, which is made of 18-karat red gold and features a GMT function. It has a power reserve of 10 days, or 240 hours. A linear power reserve display indicates how many days' worth of energy the watch has remaining. Its blue, sunburst dial is incredibly eye-catching and goes perfectly with the case and matching blue alligator leather strap. This timepiece (PAM00659) costs around 30,000 euros.